Is it safe for your dog to eat Grass? Read more to find out. Dogs are omnivores, and grass is one of the most common plants that dogs have been eating for thousands of years. Some theorize that dogs do that because they need more fiber in their diet. Or maybe they just crave a salad. You can try giving other leafy vegetables instead of grass with no problem. It’s normal for sick dogs to eat grass and then quickly vomit. Dogs typically do this so that they can throw up something they previously had eaten which was irritating their stomach. 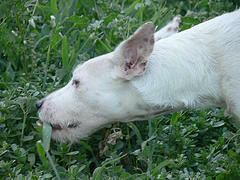 The grass helps stimulate the vomiting, and dog instincts tell them they should eat some. So, if your dog suddenly chews a little bit of your lawn, don’t fret. Be careful though that your dog does not eat grass treated with chemicals such as insecticides, herbicides, or fertilizer. What do other dog owners have to say about whether their dogs can eat Grass or not? See comments below. When my do throws up, espessicially when he is outside, he eats grass. I would like to know why he ate the grass. Is it like a healing aid? I really need to know. It seems like my dogs eat grass when they want to vomit. All 3 of my dogs eat grass regularly, not just when they feel sick. They seem to enjoy the taste. One of them even likes little tree shoots that pop up in the spring. She loves the leaves on this particular kind of tree, but only within the first couple of weeks. I guess the taste must change as the plant matures. From what I have read, many dogs do like the taste of grass. I have two pit bull puppies that are 10 weeks old. They absolutely love eating grass. We had to put some of our plants inside due to the cold weather and our puppies would not stay away from them. They love eating regular grass but they also eat dried up grass and roots. It’s kind of wierd but they like it and they never throw up. If they like it and it isn’t harming them.. Guess they can keep eating it. My dog loves grass and he never vomits after it. He loves it when it first sprouts. He also loves to rip apart other green and red leafy veggies like spinach. Just remember each dog had his own tolerance to food. My dog would eat steamed carrots and cauliflower everyday if I let him!!! But of course he loves meat. Everytime I see my dogs eat grass I know whats going down and keep them outside (with my company of course)and my theories are corrected. Though then I usually shoo them away from it to examine it (yes weird) to see if there was anything they shouldnt have eaten was in it. i have a pitt mix-felix and a timberwolf/german shep mix-koda. they both eat grass every single day and koda seems to love eating wood. pine especially. they dont throw up afterwards.. does anyone else know of maybe why koda would be chewing on pine trees.. seems like i have pine mulch all over my house as she drags sticks of the pine in on a daily basis and demolishes it. even if i take it away she still manages to go get more from what i think is a stash she has… any ideas? Know if dogs can or can't eat Grass? Help other dog owners by leaving a comment.